Review: Murder For Two. Nottingham Theatre Royal – East Midlands Theatre. Just when you thought the murder mystery had finally bitten the dust, along comes ‘Murder for Two’ at the Nottingham Theatre Royal to firmly put a bullet through that idea and present incontrovertible evidence to the contrary. This fast-paced, slick musical comedy examines the genre, dissects it and sends it up in a rollicking parody, and all through the medium of just two multi-talented actor musicians. Ed MacArthur, as Officer Marcus and Jeremy Legat, as The Suspects, are pin-sharp in their delivery and have the audience laughing out loud with their talents and versatility. With more than a nod to Agatha Christie and the tradition of the ‘whodunnit’, enter the Detective (who’s not a Detective) to solve the mystery of the murder of a famous author. He is presented with a motley selection of suspects, all with their own motives for wanting said author dead. But in place of the cavalcade of ‘upstairs/downstairs’, costumed and liveried characters we might expect, we have Jeremy Legat, playing ALL the suspects. With just a change of posture or accent or the addition of a simple prop, he conjures up a host of figures. There is Dahlia – the failed actress and widow who seems less concerned with her husband’s death than having a real live detective in her living room. Murray and Barb, the bickering couple with a love/hate relationship. Steph, the aspiring criminologist with a vested interest in testing her theories on a real live – or dead – subject. And three 9 year old choirboys, separated from the rest of their choir by a nasty accident at Scout camp. In total, there are 12 suspects, all played by Legat with great dexterity and focus. 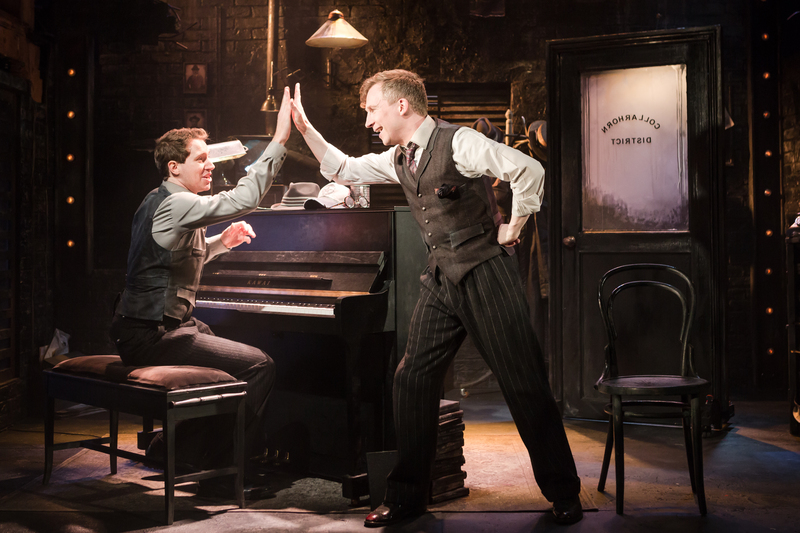 As if both MacArthur and Legat weren’t busy enough just getting through the changes of character and following the story, they both play the piano to accompany each other in a series of musical theatre style comic numbers. 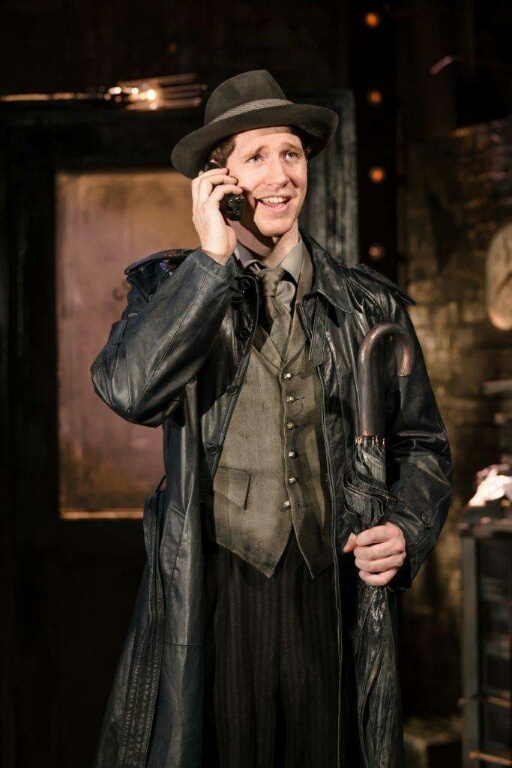 Many of the songs have a familiar feel, rhythms and phrasing echoing ‘tropes’ of musical theatre – the friendship song, the big number, the haunting ballad – and more than a dash of the wit somewhere between the dryness of Noel Coward and the saucy innocence of Victoria Wood. All are delivered with immaculate diction and perfect comedy timing. 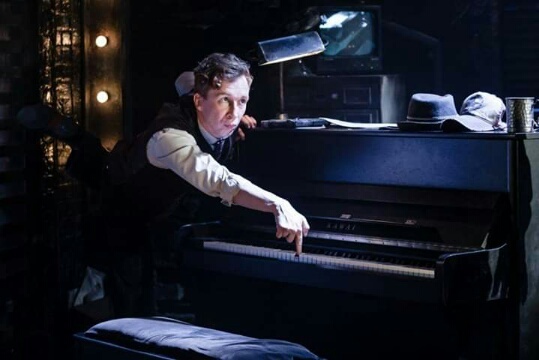 The wonderfully atmospheric set conjures up the image of a comic book gumshoe detective in a sleazy basement, complete with a piano and a multifunctional hat-stand. Later transformations to the set are somewhat unexpected and definitely enter the make-believe world of musical theatre – I mean, everyone needs a spotlight and a glitter ball right? 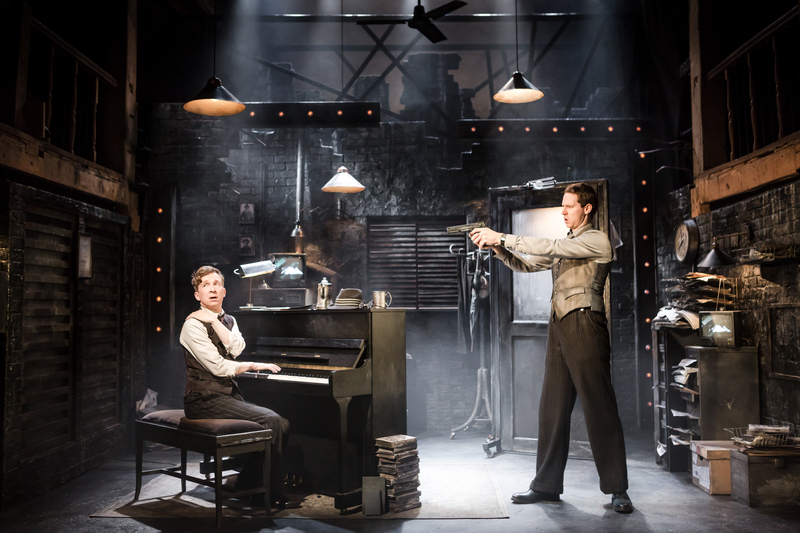 ‘Murder for Two’ was a huge off-Broadway hit and this new production by The Watermill Theatre is on at Nottingham Theatre Royal until just Wednesday 28th. Its murder-mystery mayhem of the highest order, superbly delivered. If I were you, I’d kill for a ticket.